I think they are almost the perfect food. They are chock full of vitamins and minerals. It has a cool outer peel, so if you get the outside dirty, you can still peel it and eat it. Sometimes if you get greedy like me you have extra around your house. Sometimes those extras get a bit over ripe. When that happens, I chuck them in the freezer, skin and all. Yes, they turn black. That is fine though, the inside is still good. When they have thawed, I remove the peel and use them as if they were fresh. So now you can make this recipe with your fresh or frozen bananas. Spray the muffin tins with cooking spray or put liners in each of them. Peel the bananas and place them a bowl and beat them with an electric mixer. In a small bowl combine the flour, baking soda, and salt. Add the sugar, shortening and eggs to the banana mixture. stir in the flour mixture just until the batter is blended. Pour the batter into the muffin tins to about 2/3 full. Bake for 15 minutes or until a toothpick inserted in the middle of the muffin comes out clean. Yum, these sound wonderful. I am the same way, always buy a few too many bananas! A great reason to make these delicious muffins! Bananas are probably the most versatile fruit when it comes to baking, you can make just about anything with them! Your muffins do look moist and tasty-delicious post! These look delicious! I love having over ripe bananas in the house, they make for great cakes, breads & muffins! Your muffins look delicious & super cute cupcake liners! The muffins look delicious, will be making for breakfast soon. I freeze my near-gone-bad bananas too but they can be kind of scary to find in the freezer! I used to buy organically grown bananas but read that that is really not necessary b/c of their thick peels. You can’t beat a good banana muffin for breakfast and these sound great! These look great for breakfast. I love banana muffins. These are the perfect breakfast muffin! Bananas are the best for breakfast – and just making them into muffins is genius 😀 Look delish! 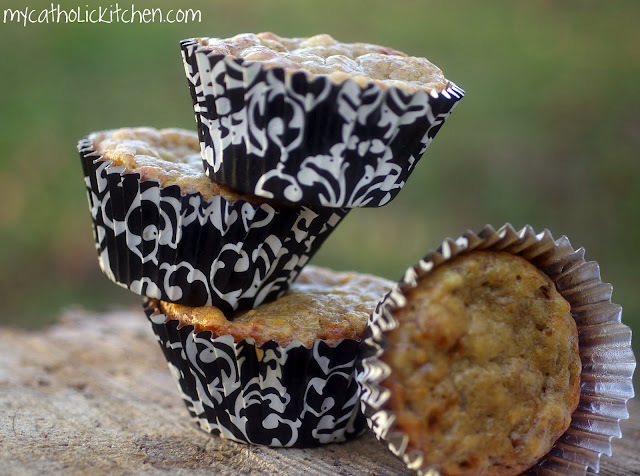 Great idea re: freezing the bananas – I love these muffins!